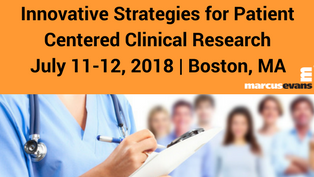 At the Innovative Strategies for Patient Centered Clinical Research Conference, July 11-12, 2018 in Boston, MA will bring together the foremost leaders in Clinical Innovation, Clinical Trials, Clinical Operations, and Clinical Research to explore ways to address challenges in delivering real value from patient centric clinical trial initiatives. Foster a fully patient centric clinical model to enhance research and trials. Leverage different tools and technologies to better incorporate patient perspective while creating more patient centered clinical research. Hear key practical case studies from companies such as TESARO, Sanofi, BioMarin, GlaxoSmithKline, and many more! To visit the conference website, please visit https://goo.gl/gqRoJc.